My ideas outlined earlier this week look on track. In fact, some of the computer models (European) are beginning to suggest a series of tornado setups across the central to northern Plains next weekend (June 11-13). This could be rushing things by a couple days, but the point is the computer models are catching on to things. Now, I just need a series of good setups to fall on a weekend. Whether it’s the weekend of June 12, 19 or 26 is irrelevant. It just needs to be a weekend. Although, one of the concerns I still have is just how far north the setups will be. The intense heat over Texas suggests a strong heat ridge will keep troughs from digging too far south. If anything, most troughs will be forced further north, over the ridge. So, the concern is the tornado setups will be across the Dakotas into Minnesota and possibly Canada. However, if enough Pacific energy gets into the pattern (which is quite possible), the troughs will be strong enough to bring setups further south into Nebraska and Iowa. This may be possible thanks to a strong central Pacific jet, along with the GWO hanging around phases 8/1. While there have been tornadoes over the last week across the high plains, we have been in a period with a relative lack of significant severe weather outbreaks. I believe that will change in the June 10-20 period. This change will be brought on by the MJO becoming re-established over the Indian Ocean (http://www.esrl.noaa.gov/psd/mjo/Forecasts/images/bmo.mjo.latest.png). At the same time the GWO (Global Wind Oscillation) will work with the MJO to make the pattern more conducive for synoptic scale severe weather outbreaks over the Plains. What a mouth full! I’m just trying to say I do not believe the chase season is coming to an end yet. In fact, quite the contrary. From what I’m seeing, mid June should light up across the central and northern Plains, with plenty more opportunities for chasers to see significant tornadoes. For my sake, hopefully one of these setups will occur over a weekend so I have another opportunity to see another tornado this year. After all, I have numerous airports at my disposal nearby here in CT. All I need now is a good Saturday tornado setup! This is a short post, but I wanted to make a quick update. Saturday, May 29 looks like a decent tornado setup for northeast Colorado/western Nebraska. The setup has it’s fault’s, but it should produce at least one good tornadic supercell, if not one or two others that end up producing a tornado at some point. I’m gaining interest in more setups to come in mid June. With the MJO is expected to move back into the Indian Ocean down the road, and the trend towards La Nina, another period of active severe weather setups should unfold around mid June. In the meantime, good luck to those taking advantage of the holiday weekend to chase the high plains on Saturday! I would say today is a marginal chase day, but tornadoes have already been reported in Colorado and New Mexico. Tomorrow is another marginal setup over the high plains. Then, things get more interesting across eastern Montana Thursday and Friday, as an intense shortwave moves in from the West. CAPE, shear and moisture will support tornadic supercells, but the CAP could be an issue, along with the horrible road network up there. Then the shortwave begins ejecting into the high plains of South Dakota, Nebraska and Kansas on Saturday. This could be a huge day across western Nebraska if the GFS is correct. I’m worried the shortwave will track further north, bringing with it important upper dynamics and wind shear. We’ll see. Sunday would be another potential setup over Iowa and Minnesota, pending how far north and east the shortwave ejects. So, this could end up being a pretty nice Memorial Day weekend chase trip for some. Especially for those who start out in Montana on Thursday or Friday! Good luck to all chasers out there. On another note, I wanted to touch briefly on all the drama I’ve read about the recent mass chase convergences and associated irresponsible behavior that has occurred over the past couple weeks. I don’t have much to say since everyone has a right to get in their car and follow a storm. But it’s become such a problem that a well known storm chaser has recently decided to stop chasing, basically so that he/she won’t be part of the problem. I guess I never imagined a passionate chaser would actually come to that decision, but then I think about just how cluttered it gets out there while chasing a tornado. Chasing really has changed a lot over the last ten years. It just makes me stop and think (really?) when someone decides to stop chasing because of what chasing has become these days. Part of me feels a little sad, and the other part of me feels like you have to evolve as the hobby changes with technology. Good or bad, that’s where we stand these days. But then again, I think chasing needs to de-evolve in some ways. You have paper maps, a weather radio, and you watch the towers develop. At what point did chasing become such a competition between other chasers? Storm chasing should be about YOUR experience, not worrying about what someone else got that day, or what you could have seen. I think a lot of chasers forget that and get caught up in all the crap that’s outs there these days. It’s been a while since I’ve posted. Since my last post, I drove across the country again, but this time it was back to Connecticut from the Great Plains. 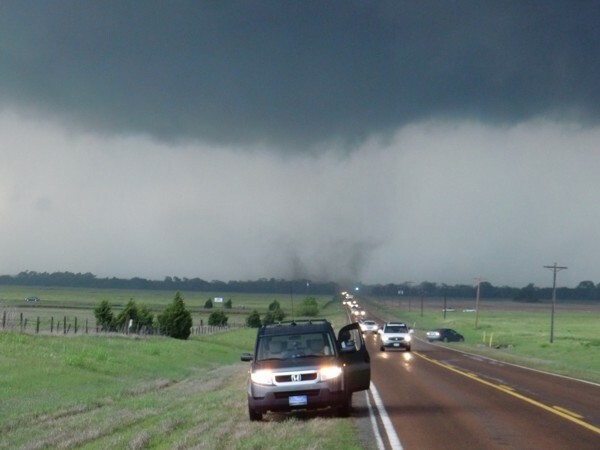 A lot has happened in the chasing world since then, including numerous big tornado days. Unfortunately, I wasn’t able to chase on those days. But, the tornado days are far from over this season. Today is a good example, with another moderate risk for tornadoes in the Dakotas. I don’t feel so bad missing out on this day, considering storms will be racing north-northeast at 65 mph. I already chased a day similar to this, with storm racing northeast at 60 mph. That day was May 10, and I saw some nice tornadoes. Next time, it will be nice to chase slower moving storms! But, good luck to those out there today. At least one of those storms will likely produce a nice tornado at some point, but it will be tough staying on the storms for sure. Looking ahead, the next tornado setup appears to be Saturday, May 29 from northwestern Kansas into the Dakotas. Depending on the speed and timing of the associated upper air trough, there could also be a chase setup on that Sunday or Monday (Memorial Day). Stormgasm.com storm chasers Jim Bishop, MaryLeigh Bishop, Sarah and Jesse Duncan witnessed a total of eight tornadoes on May 10, 2010 across northwestern Oklahoma and southern Kansas. The video is a highlight of those tornadoes, beginning with the tornadoes near Wakita, Oklahoma. The final tornado is a wedge tornado in Arkansas City, Kansas. I was shooting video on a new camcorder that I was not use to, so the video quality isn’t as high as normal. Plus, storms were moving northeast ant 60 mph. So, I did the best I could. 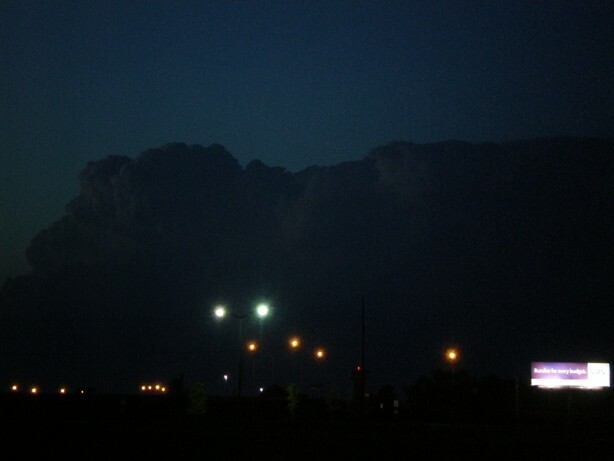 The following photos were taken on the May 12, 2010 storm chase in southwest Oklahoma. I will try to post photos from the May 11 chase soon. Also, I’ll post my tornado footage as soon as I can from Monday. The video of the wedge in Arkansas City, KS is short but really intense. It really was quite a site in Elk City, Oklahoma in a shopping center parking lot. 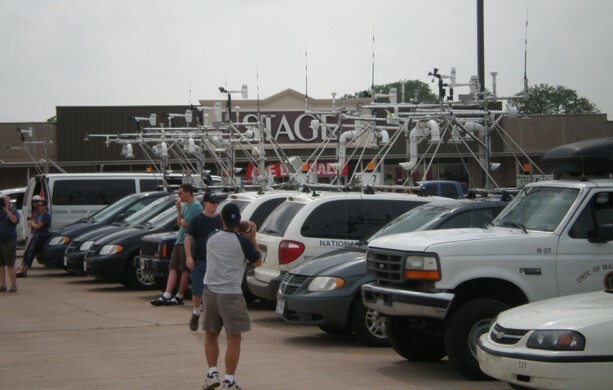 There must have been 30 different vehicles, all associated with Vortex 2, all waiting for storms to form. It looks like the researchers got really bored and started throwing around the football. Can’t blame ‘em. It was kinda funny when storms first began to fire to our west. Once this occurred, everyone started leaving in groups. The locals must of thought a violent tornado was coming or something, because you had over two dozen tornado research vehicles all leaving the same location at once. I did have a chance to meet up with Simon, Juston and the Storm Riders crew. In addition, I met Dr. Greg Forbes, the severe weather expert on the Weather Channel. He seems like a really nice guy. We exchanged chase stories from the Monday tornado outbreak. Above is a shot of one of the many wall clouds we witnessed. This supercell was high precipitation and cycled quickly. But, I never saw anything that every came close to producing a tornado. In fact, there was hardly any actual rotation in these wall clouds. We stayed on this supercell until dark. Throughout its life there were all kinds of scud clouds, scud bombs and tornado lookalikes, but I never saw anything that came close to being a tornado. After spending quite some time looking at data in Sayre, OK, my wife and I repositioned a bit further northeast in Elk City, OK. In doing so we bumped into Simon, Juston and the producers for Storm Riders, along with the entire Vortex 2 crew, who happened to be two exits down the road. I’ll post a picture later. We ended up on a supercell in southwest Oklahoma, south of I-40 for about 2 hours in the early evening. 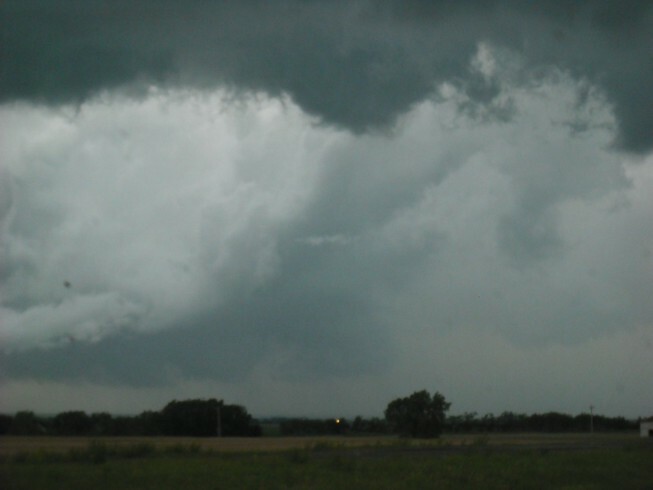 It produced numerous wall clouds that exhibited very little rotation. Apparently, there were tornadoes reported on this storm. I suppose it’s possible there was one brief tornado when I was repositioning. But the storm itself never appeared to have strong low level rotation, and I never saw anything that looked imminent. For what it’s worth, Vortex 2 was all over this supercells. I’m really curious to see their data some day to explain why this storm wasn’t more tornadic! It’s late, that’s all for now. I’ll post pictures when I have more energy…. Yesterday was a frustrating chase across western Oklahoma. We saw three separate LP supercells, all which struggled with the CAP. In short, we captured some nice structure shots, but no tornadoes since the storms were constantly fighting the CAP. This really makes me appreciate what we saw on Monday. Today looks more promising along the dryline across western Oklahoma. The CAPE/shear combination should yield tornadic supercells by the late afternoon. The CAP shouldn’t be an issue today given the upper air support. But, we shall see. I’m still ironing out my exact target. After spending another night at a friend’s house in Wichita, we are targeting parts of western Oklahoma again today (Tuesday). Models indicate the front will lift north and stall over parts of northwestern and western Oklahoma. Extreme instability is expected to develop along and south of front, with CAPE in the 3000-5000 j/kg+ range. Low level shear and hodographs support tornadoes, especially on any supercell that fires along the boundary. However, there is considerable uncertainty on whether or not storms will actually form. Mid level temperatures are expected to be quite warm, and in the absense of any significant upper disturbance, the CAP my not break. So today is a conditional setup. Should a storm actually form, it could be a tornado producing machine. Only this time, the storm will be moving east at 30 mph, instead of northeast at 60 mph. Needless to say, this will make for any easier chase if storms do indeed form. What a day! MaryLeigh, Sarah and Jesse Duncan and I witnessed eight tornadoes across northwestern Oklahoma and southern Kansas on Monday, May 10 2010. It’s late and I don’t have time to post video. But we have some great shots west of Wakita, Oklahoma (first two pictures). The last picture is a video capture of a violent wedge tornado that developed less than one half mile to our east in Arkansas City, KS. Storms were moving extremely fast (around 55 mph), so keeping up with them was nearly impossible. But we did a great job and saw saw incredible tornadoes and supercells. The pictures below were taken by Jesse Duncan. I shot the video. MaryLeigh also has some great pictures. But truly an awesome day. Could have more tornadoes tomorrow and Wednesday!!! Tornado west of Wakita, OK. Taken by Jesse Duncan with other Stormgasm chasers. Tornado west of Wakita, OK, taken by Jesse Duncan with other Stormgasm chasers. Wedge tornado in Arkansas City, KS. Video capture, shot by Jim Bishop, along with other Stormgasm chasers. Today features the kind of setup that produces large, violent, long tracked tornadoes. Unfortunately, storms will be moving east around 50-55 mph when they form. Once they start producing tornadoes, they should ‘slow down’ to 45-50 mph. That’s still very fast and will make chasing difficult. Hopefully we’ll get on the right storm and see a major tornado, possibly even a historic one. On another note, my video camera died yesterday afternoon during a test run (it wouldn’t turn on). After about 20 minutes of trying everything to get it to work, I was forced to go into Best Buy and be at the mercy of whatever they had left after their Mother’s Day sale. Lucky or unlucky, the only camera they had in stock that records in HD and has manual focus capabilities was a refurbished Sony HDR XR500. This is actually a pretty good camera. The only thing I don’t like is it records on a hard drive. But at this point, I’m just glad I have a high quality camera ready to record tornadoes today! Sunday, 9 May 2010: 8:30 p.m.
Storms are going to be racing east-northeast tomorrow around 50-55 mph, maybe even faster when they initially develop. I imagine that once they begin producing tornadoes they will slow down to 40-50 mph. This is going to make chasing very difficult. However, the fast storm motion will increase the chances of very long tracked tornadoes occurring. I really hope Vortex 2 can keep up so they can gather some amazing data for their research. Maybe someday their research can help save lives on days like this. Sunday, 9 May 2010: Early a.m. The latest WRF model continues to eject the shortwave slower than the GFS. I’m a little surprised to see this, seeing as how the European had been on board with the faster GFS idea. Nevertheless, it’s very interesting to see the WRF keep the dryline further west across western and west-central Oklahoma in the afternoon/evening. 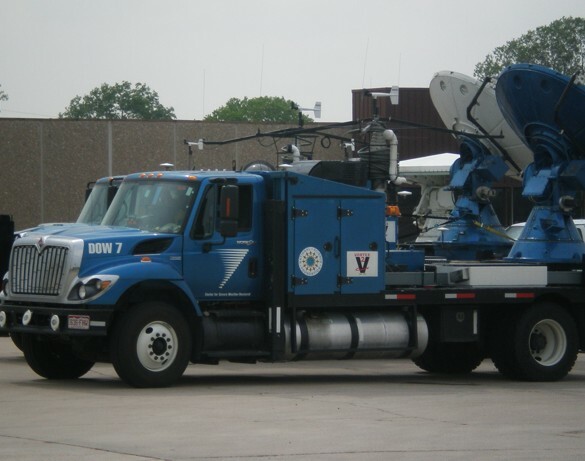 This will allow for supercells and the resultant tornadoes to track across a more chaser friendly terrain. I do worry how quickly the low level moisture will return north. The WRF hardly has mid 60s dewpoints to the I-40 corridor by 1 p.m. Monday. Though by 7 p.m., the mid 60s line reaches Wichita Kansas. So, it looks like a very rapid return of moisture could be in place in time for tornadic supercells to fire in the very late afternoon along the dryline. This would result in potentially long track, violent tornadoes in the early evening across central/north central Oklahoma and southern Kansas on Monday. We’ll see if the WRF remains consistent with the slower/further west solution. But even if the GFS is correct, there will be tornadoes, some long track and violent, but moreso east of I-35 across Oklahoma and Kansas. Putting Monday aside for a moment, Tuesday and Wednesday both have significant potential for tornadic supercells. Both days will feature an approaching mid level trough and a strong, southerly 850 mb jet. Deep, low level moisture will be in place from north Texas into Oklahoma, contributing to CAPE in the 2000 -4000 j/kg range. Storms could fire off the dryline across western north Texas to western Oklahoma, or along the stalled front across central Oklahoma. Basically, there are going to be more tornadoes on Tuesday/Wednesday from north/western north Texas into western to central Oklahoma. This upcoming week (namely Monday – Wednesday) is turning out to be the prime time this month to go storm chasing. I’ve be watching what the computer models have been showing for Monday, May 10 for the past several days. Each time the day exhibits factors that are present on historic tornado outbreaks. A strong shortwave will be ejecting eastward into Oklahoma/Kansas in the afternoon/early evening. A surface low will deepen over southwestern Kansas and slowly track east, causing a dryline to mix east. A 40-50 knot southerly 850mb jet will develop beneath a 60-80 knot 500mb jet out of the west-southwest. This is the kind of shear that supports violent, long track tornadoes. In a broad sense, the setup is likely to produce a few tornadic supercells, with at least one violent tornado. But there are questions to be answered. The first is how far north the deep, low level moisture will return. The second is how early morning convection associated with the rapid moisture return will effect the day. Namely, how quickly that convection will clear out and allow for good daytime heating. Finally, models still don’t agree on how quickly the shortwave itself will eject eastward into Oklahoma/Kansas. Thus, we can’t be too sure this early in the game how far east the dryline will mix. So the target could be anywhere from western Oklahoma/Kansas stretching into the I-35 corridor to as far east as eastern Oklahoma/Kansas and western Missouri, depending on the timing of the shortwave. We shall see. Either way, I think there will be some violent, potentially long track tornadoes on Monday. Thursday, 6 May 10:00 p.m.
Anyways, we watched a decent lightning display for a few minutes. At least I made a good forecast, though I wish I could control the time of day when a storm will develop! Now it’s time for two down days before heading to the Texas panhandle for the next chase on Sunday…. I’m sitting in Norman, OK trying to decide on a chase target for today. I’ll most likely be heading north into Kansas and choosing a target based on new data as the day progresses. But, a strong CAP will keep any convection that does fire during the day from firing until around 6 or 7 p.m. If a storm can actually form in daylight hours, it could be a spectacular supercell in an environment that would support tornadoes. Sunday could be big across the southern Texas panhandle/caprock if the CAP can be broken. But, it certainly looks like a much better setup than today. Monday looks HUGE. IMO, it looks like a classic setup for numerous tornadoes, some violent and long tracked, across western/central Oklahoma and western/central Kansas. Monday has the potential to be the best tornado day of the year across the southern plains, based on what I am seeing this morning. Then Tue/Wed both appear to hold chase opportunities along the stalling frontal boundary as more shortwaves continue to eject eastward from the southwestern U.S.
Needless to say, despite today’s marginal chase setup, there will be plenty of good chase setups in the days to come. After having a few down days in middle TN, it’s time to drive back to Oklahoma and get ready to be in position for the chase setup on Thursday. The latest WRF model shows the CAP breaking near the triple point across the central Kansas. With very backed low level flow and veered mid level flow, this could be a prime area for tornadic supercells. Dewpoints are forecast to be in the lower 60s by the early evening, supporting 1500 to 2000 j/kg of CAPE. Ingredients certainly appear to be coming together for quite a show Thursday evening. Hopefully, the upper level support is strong enough to actually break the CAP (like the model suggests) and allow for supercells to develop. Should that be the cape, tornadoes appear likely. Thursday (May 6) is looking even better in terms of strong wind shear across Oklahoma and Kansas. According to the 12z WRF model, the low level wind shear would strongly support tornadoes. The main issues with this setup will be the strong capping inversion that will keep storms from forming throughout much of the afternoon and early evening. But, an upper level disturbance is forecast to eject eastward across the region in the evening. Hopefully that will be enough to break the CAP and allow supercells to form off the dryline. If nothing else, this setup has a lot of potential. Next week (May 9 – 14) looks active in terms of good setups for tornadoes across the southern Plains. The MJO is becoming re-established over the Indian Ocean as I type. In a few days, convection will propagate into the Indonesia region and the response across the U.S. will be deep troughs digging into the southwestern U.S., ejecting into the Plains. Sure enough, medium range models are in good agreement in developing a long wave trough next week over the Southwest, with shortwaves ejecting into the Plains Sunday through Friday. 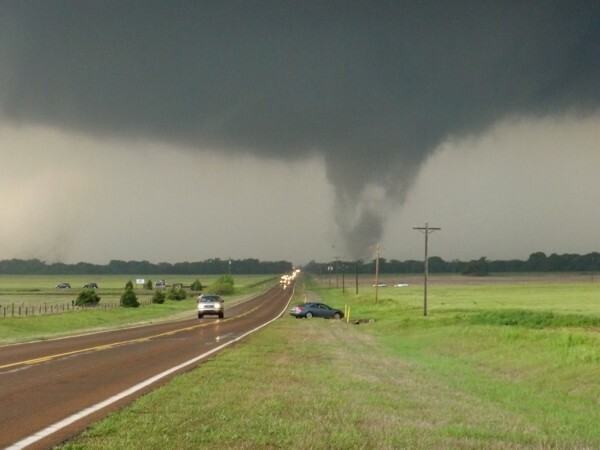 The period from May 9 – May 14 may be one of the most active periods during the month for tornadoes across the Plains. In the shorter term, the next chase opportunity looks to be Thursday across Oklahoma or Kansas. Visit Stormgasm.com to view tornado videos and storm chasing photos.